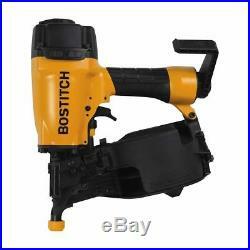 Bostitch N66C-1 1-1/4" to 2-1/2" Aluminum Housing Pneumatic Coil Siding Nailer. 1-1/4" to 2-1/2" Aluminum Housing Pneumatic Coil Siding Nailer. The Bostitch 1-1/4" to 2-1/2" Aluminum Housing Pneumatic Coil Siding Nailer (N66C-1) is designed to be used for a variety of applications including wood siding, cedar shake shingles, and fencing. It can use any 15° wire weld and plastic inserted coil siding nails that has a length of 1-1/4" to 2-1/2". While the tip has a soft rubber foot that is designed to prevent damage to softer woods. Designed to drive wire-weld and plastic inserted coil nails that are between 1-1/4" to 2-1/2" in length. The adjustable depth guide allows you to easily set nails to desired driving depth. The lightweight magnesium housing adds extra durability while keeping it lightweight. The soft rubber foot is designed to prevent damage to softer woods. The easy to adjust tool-free exhaust allows you to direct the exhaust away from yourself. Drive Type: Angled Head Style: Full Round Collation Type: Wire/Plastic Collation Angle: 15 Fastener Range: 1-1/4 to 2-1/2 Inches Shank Diameter: 0.080 to 0.090 Inch CFM per Shot: 0.033 CFM Required Pressure: 70 to 100 PSI Maximum Pressure: 120 PSI Magazine Capacity: 300 to 350 Nails Exhaust Type: Adjustable Tip Type: No Mar Housing Material: Aluminum Plug Type: 1/4" NPT Length: 10.5" Width: 4.58" Height: 11.58". One (1) 1-1/4" to 2-1/2" Coil Siding Nailer. The item "NEW STANLEY BOSTITCH N66C-1 PNEUMATIC ANGLED SIDING COIL NAILER NAIL GUN KIT" is in sale since Thursday, October 18, 2018. This item is in the category "Home & Garden\Tools & Workshop Equipment\Workshop Equipment\Flashlights & Work Lights". The seller is "we-always-open" and is located in Staten Island, New York.